Canadians order kefir grains (milk kefir & water kefir). Buy kefir online. Ask questions about kefir in the comment section, and have them answered quickly. Kefir making video course available too. If you wonder where to get kefir grains and you live in Canada, this is it! Many suppliers don’t ship in Canada. We will. Water kefir is a delicious, healthful, fermented probiotic drink that you can make easily and inexpensively at home. Dehydrated water kefir grains are live grains that have been dried for storage. These water kefir crystals are effectively in hibernation, lying dormant until the are returned to a sugar/water bath and brought back to a live state. 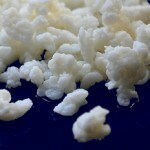 Milk kefir grains are especially for culturing milk into a probiotic, slightly carbonated delicious and healthy beverage. People who have issues digesting milk can sometimes drink milk kefir because a lot of the lactose is pre-digested. Please read more about how to make milk kefir by clicking the Milk Kefir Grains link. Kefir (which you can pronounce “Kee-fur” or “kay-Fear“) is milk or sugar water, innoculater with a special culture to make a slightly fizzy probiotic health drink with a myriad of benefits. Canadians Ordering Water Kefir Grains and other cultures do not have to worry about Weather conditions and the safety of your purchase. We know how to prepare your purchase for shipping, so if your kefir grains freeze in the mail, you can be sure they will still make a great product. Don’t let the Canadian winter scare you from ordering. We’ve got winter in Canada covered! Some time ago I read a lot about these little grains that you could put in milk or water and it would turn a regular beverage into a super food powerhouse of probiotics and vitamins. I have had digestive issues for most of my life. I take prevacid which is a “proton pump inhibitor” (PPI) that reduces the amount of stomach acid that is produced because of unbearable heartburn and esophageal reflux, and i have been taking it for many years now. I have also had a real problem with constipation. Given that my grandmother died of colon cancer, and my mother currently has colon cancer, I was very interested in things I may easily incorporate into my diet to add a layer of protection. During my kefir research efforts, probiotics kept popping up as helpful. Research suggests that kefir and other probiotic rich foods and drinks could help with constipation and heartburn, and protect against bowel cancer, as well as a host of other benefits that surprised me! I know that you can buy kefir in the grocery store, but I also read that if you could find someone who made kefir, you could get the kefir grains culture. The problem was none of the friends I asked had even heard of kefir, let alone made it at home, so I turned to the internet. Obviously a very useful article but here in the UK we do not measure in cups. How big is a cup? Is it a coffee cup a large tea cup or an even bigger breakfast cup or a half pint mug? A cup measure is meaningless. What we need is volume in preferred units like ccs or mls or even good old fashioned pints. You could also give it by weight ie so many grams. Everybody has got scales at home these days. Cups are archaic. It would also be good to know recommended times to take it ie per day, per week or even, times per day. Hi Gwen Thanks for your message. I’m sorry you are having trouble. If you are unsure of the measurements on our site, you could try Google to convert imperial measure into metric. Hi Marie Thanks for your question. In order for the grains to thrive and grow their beneficial bacteria they need sugar. Water Kefir grains thrive on regular sugar while milk grains thrive on Milk sugar (lactose). There’s no way around this. 1/4 cup sugar sounds right- remember that the final beverage doesn’t have that much sugar, the grains are basically eating and digesting much of the sugar in the water. According to your website, your Water Kefir Grain is Gluten-free and vegan. Is it also soy-free? Sorry, I’m new to kefir making. Are your kefir grains non-gmo, gluten free, and organic? Sorry if I missed that somewhere. I had a couple thoughts and wanted to ask. What is included in the video course for kefir? I suspect the next answers are yes… but I will ask anyways. Are your kefir grains gluten free, non GMO, and all organic? I usually see this for others and I suspect anyone making kefir does it this way. Hi Jeff Here are all some of the questions the course will answer What should you do when you first get your grains? How long should you wait before drinking your first batch of Kefir? How to save money making your kefir. Through many trials and error I have discovered the most optimal way to set up Kefir Jars to allow for the fastest strain of milk while still retaining the Kefir Grains. And you can literally clean them in seconds. I will tell you about the best jars you can use and show you how you can easily set them up yourself for the MP Method. 99% of the time you can find all this for Free. But don’t worry I have links for you if you can’t find these things. As most of you probably know kefir grains do not like metal strainers. No worries, I’ll show you how to fix this. The MP Method Makes Your Daily Kefir Making Process Much Faster, Easier and Cleaner. Perfect for making a daily dose of kefir for one or two people. I will also show you How to set up the MP Method for a Family Dose. Learn about the ratio of grains to milk. Discover how time and temperature affect the fermentation process. See with your own two eyes the different stages of fermentation. (Know when it is good to drink and learn when it is not ready or over fermented) You can read all about this in text but you’ll never know for sure until you have an experienced person show you. You’ll learn how to rebalance the acidity of the grains if you happen to forget about them for a few days. Learn what to do when you get an early separation. Know when to consume it at its peak stage. I will show you a few different ways you can eat or drink this kefir depending on your goals. As a fitness trainer, I will also give you some personal advise on how to use kefir for exercising and losing weight. Should you drink it with food or by itself? Should you refrigerate it or not? Should you really wash your grains? When is the best time of day to drink it? How much should you drink everyday? Learn what to look for to see if your milk contains the Grass Factor, this just shows you that you are getting the highest nutrients possible. How you can find better and possibly cheaper sources of milk. Learn all about storage for a week, a month, or years. There are 4 different methods. Also see how to bring them back from their resting stage. I’ll show you my top 2 favorite simple and easy to make recipes. Learn how to apply kefir on your body for dandruff, itchy scalp, psoriosis and other irritated skin rashes. I am going to show you how to add the special magical powers to these babies that will make them stronger and grow faster. And you won’t beleive it until you taste it but it will also make the kefir taste better! I will show you how you can really test this. You will learn many personal experience tips and tricks you can use to help you make and use your kefir. Just as a little side bonus I will show you how I feed it to my pups and how they rip into this stuff! Quick questions: Is the price in US or Canadian funds? Also, in October you mentioned that “This time of year, I generally ship them fresh”. Are they also fresh in May? Thanks! Hi Lucie USD – and we always ship fresh now- We are packaging them for shipping differently, and find they do better this way. I make my own yogurt at home adding 3 tbsp of 6% Astro plain yogurt to 1.3 liters of boiled milk. What if I wanna use the milk kefir that is offered here? Can I use it instead? The payment has to be paypal or other way ? Hello, I received my milk kefir approximately 2 weeks ago and have had the grains in milk ever since. I’ve replaced the milk every 24-48 hours. Now I’ve left it for 3 days to see if it would form a good solid consistency instead of curdling like cottage cheese and separating, but no luck. I’ve had milk kefir in the past and it created a lovely yogurt-like consistency. Am I doing something wrong? I am using all of the grains that came in the bag, in about 2 cups of milk. Your help is appreciated in advance. Hi Lianne Try using more milk… doubke even. If that doesn’t work after a week or two, try adding a couple of tablespoons of milk powder. The idea is to super feed them. It’s not that you are doing anything wrong…The grains need some time to adjust, and they behave differently based on so many different things it is hard to pinpoint. Chances are they are just really active and hungry, and the bacteria are multiplying too fast for the food they have. There are a few days I`m drinking the kephir water and I feel it`s doing good for me. Try avoiding sugar and wheat, because they are the reasons you feel without energia. Also, add walking at least one hour every Day. This will help you diminish your shape around the middle. It will also help you sleep at night. I was thinking of ordering some milk kefir grains. How do you ship your grains? Partially dehydrated, or fresh? Thanks so much! I have been in search of kefir grains for a while and most don’t ship to canada. So thankful I found your site. I was looking and couldn’t find any mention if your product’s is organic . Can you please let me know . Thank you for the emails explaining and with the links for the videos. Very much appreciated. My pleasure Beth. Glad to know you got them. I hope you love your kefir! Hi Catt All of the equipment we use is cleaned well. There’s no milk in our water kefir. There.s no milk grains mixed in. We do have both in the same kitchen though. We are as careful as we could possibly be. If it were me, I would feel solidly confident in using the product, but I can not make any 100% iron clad guarantee because we use the same equipment for both (washed well in between of course.) Buy at your own risk, knowing these things. I have been trying to make water kefir. My grains are not multiplying, but it started to grow a “scoby” on top. Is this normal? Hi Ingrid Water kefir won’t grow a scoby on top. Sounds like you got some cross contamination. I have a question concerning water kefir. My local Bulk Barn says they cannot get organic apricots (no sulphur) anymore. I contacted Bulk Barn headquarters and they said they may have them again in September. I haven’t found them anywhere else. You said you can substitute raisins. All the raisins seem to be coated with oil. Is that a problem? Is there any other fruit I can use? Also, can you tell me the purpose of the apricot? Does it aid the fermentation, or is it just for flavour? Hi Jack The role of the dried fruit is to provide flavor, increase nutritional value and they “may” aid in fermentation. Truthfully I have tried water kefir without it and after a week the grains are not growing any longer and fermentation is lagging. The oil on the raisins will not do! Oil will ruin your brew. You can use almost any dried fruit. I have used dried cranberries successfully too. Do you have a “health food” store? We have a couple of little boutique type stores here that sell supplements and a small selection of packaged organic whole foods. It might be worth trying to find them. Other people have used figs and dates but as I mentioned I no longer recommend dates as there seems to be a problem with them more frequently even if they are labeled preservative free. Thanks for the info, Kefir Nurse. The empirical evidence from your experiment suggests that the apricot (or possibly some other fruit) is necessary for the growth of the kefir grains. Possibly the apricot provides some required nutrient(s). Fortunately, I found a health food store that has the apricots. Hi Jack That’s good news! Please come back any time if you have any more questions. I don’t have “all” the answers, but I will do my best to find out! Your order system is not working. I enter my information and it just sits there. Hi Cheryll Thanks for your message. The order system is working. The problem is in your computer. Every once in a while someone has a problem, and without being right there in your home with you, I am not able to trouble shoot. What should happen after you enter your information is that you ought to be redirected to Paypal to complete the purchase. I just tried it, and it works for me. There could be a number of things happening. 2. Your browser settings are not allowing the redirect. (try using a different browser, or a different computer. I hope these suggestions help you. I know it’s frustrating when things don’t work! I am trying to order 3 pouches of milk kefir grains and 2 pouches of water kefir grains as a group of us wanted to order in bulk. I cannot seem to put them all in the same order. Can you help me out? Hi Dawn The system we are using only allows single orders. Silly, I know, in this day and age, but we don’t charge shipping so while it is a little extra work, there’s no extra cost. I apologize profusely for this apparent lack in our system! I have a distiller. May I use distilled water and if so what extra things would I need to add? Hi Barb Distilling removes minerals. Add a few drops of Concentrace liquid minerals. Hi I may have stored my kefir grains in sugar water for too long in a cabinet and they turned brown. They don’t seem to do anything now. Is there any way to revive them? Hi Jen Rinse them very well. Put them in a jar with just enough water to cover them, and a couple of teaspoons of white refined sugar, cover them and set in the fridge. In 3 days, remove them from the fridge, drains and rinse gently and start again with the instructions for making water kefir. If they are going to revive, (and they likely will) it could take a week to 10 days. Thanks for reply,will keep at it.I appreciate your site and all it’s information. ,cooled water. second time followed directions exactly. I do to correct it? thanks for any help you can give. Hi Brenda Thanks for your message. It sounds like you are on the right track! It takes a week to ten days before your kefir settles in. Keep going! You’ll have perfectly delicious healthy kefir in no time at all! Hi Can m’y kefir milk and water kefir be next to each other in the kitchen while fermenting since they have the same bacterial profile? Hi Monique I keep mine fairly close to one another. They aren’t directly side by side but they are closer than I would keep anything else. My instinct is to say yes, but I can’t say with 100% certainty! Hi! 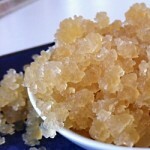 I amsolutely love kefir and have sent an email as well as ordered some water kefir grains. I’m really excited to start making my own. I have a question that’s just more for curiosity…do you know how kefir differs from kombucha (which I really enjoy also). They both have an effervescent quality and are full of beneficial probiotics and bacteria. I’m just not real clear how they are similar/different. Thank you, can’t wait to receive my order. Hi Jacqueline Kombucha is similar. It is made with tea and sugar, and the bacteria differ slightly. Also it forms a different looking culture SCOBY. Many people prefer the taste of water kefir over kombucha. Hi there, I only used a tablespoon of the live kefir grains I got. What can i do with the rest of the grains. Can I put them back in the ziplock bag and store them in the fridge?? Hi Jen Thanks for the question. Your live kefir grains will not live that long out of the sugar/water solution, and the ones you are using will grow and multiply. To store grains put them in a jar, cover with clean fresh water, add a couple of tablespoons of sugar, cover and store in the fridge. They will keep this way for a couple of months. For long term storage you should dehydrate them. Sorry one more question…it’s been over 48 hours and my grains never grew in size and none are floating. There are some bubbles at the top and it smells sorta tangy. Does it mean the kefir did their job??? Hi Jen: There’s lots of really great information throughout this blog that will answer your question. Time is also important. Keep doing what you are doing, and read through the blog. If you still have questions in a week or two, pop back over here. I want to refrain from asking another question but i didn’t realize there could be a correlation between the kefir and cramps and diarrhea. I read the FAQ and it only mentions flatulence and pain, but what about the diarrhea?? When will it ease up? I drink a glass day. If i persist and continue on with a cup a day will it slow down on its own or am i doing myself harm?? Thx. Hi Jen that can also be a sign of die off of bad bacteria, but if it is uncomfortable cut back a little and spread out the amount, for example drink 1 ounce 4 times a day instead of 1/2 cup all at the same time. Hi Lydia They might be ok. Put them in their solutions and try. They are pretty resillient! Hi Derek Often what you see on the bottom of the water kefir jar are baby grains — they are too small to really identify as such. If you look at them closely and think they could be that, great! If not, the only real way I have is to actually see the sediment. Hi Derek Same thing applies to the second ferment as the first, because you have all the tiny little bits that got through the seive. Hi, I would like to order some milk kefir grains. Do you have any available for purchase? Hi Mary A stainless steel strainer is ok… just to be sure it is stainless. Some of those mesh strainers are made of aluminum or tin and the reactive metals “could” harm your grains. I am just finished second batch and it tastes quite vinegary or could I have added too much lemon?…how do I recover the grains or do I just make a third? Also am I to rinse the grains between batches. Hi Marilyn Make a new batch daily. There’s nothing wrong with the grains. It’s just that you got dehydrated grains and they need to rehydrate and rebalance before they start making the kefir you are going to end up loving! :- ) This COULD take a week or two although in my experience it is only a few days. 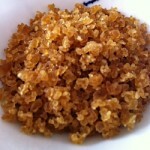 Just make sure as the grains grow that you are keeping the proportions of water, grains and sugar. This will likely mean removing some of the grains and having an extra batch going, or storing extras. Hi, I have just received your live kefir last week and followed your instructions to make kefir. The first batch kefir almost doubled. I threw away the water because it is just sweet but the water was normal. The second batch it increased by 80% only after 12 hour, but the water kefir becomes thick and syrupy. I rinsed the grains well and started the third batch, 12 hours later the water is still thick but not as syrupy. What have gone wrong? I followed your instruction on the sugar/water ratio with one dried fig(orangic) and Lemon. Should I continue to make the next batch or rest them in the fridge? Hi Ida Check the ingredients on the fig first. Does it list some ingredient starting with sulph… or some other kind of preservative? Or ANY other ingredient besides figs? The figs should actually say "unsulphured" on the label else they are probably sulphured. I am betting this is the most likely culprit.